Okay, today's a filler day because I got my 2nd and 3rd blog award! I'm pretty stoked about it, and, of course, I must pass it on! First...is the attitude of gratitude award that I received from Brittany over at her wonderfully fabulous blog, Food For Thought. Brittany, Thank you, Thank you! This time, I am passing this award on to some of my wonderful followers! I am so grateful for their loyal commenting...I feel it is their way of thanking me for posting and it makes me want to continue in this obsession of posting creative, romantic ideas. Their attitudes of gratitude are truly appreciated! 1. Put the logo on your blog and post. 5. Share the love and link to this post and the person who nominated you for this award. 6. Tell us how you've come to have an Attitude of Gratitude. Second is... 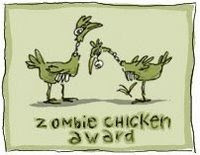 The Zombie Chicken Award from my friend, Anna Rose over at The How-To Gal. Thanks soooo much! I wanted to remind everyone to enter my GIVEAWAY which is ending on Saturday at 5 pm EST. It's super easy to enter (and kinda fun, too) and you could win an awesome Vegas-Night Package! Thank you for the award! How sweet of you! Aw, Cher, thanks!!! I'm super excited! I am so glad you left a comment on my blog because now I have a new blog to add to list of daily reads.. . . yours! Your blog is just precious . . . love the concept behind it. Hope you have a happy day. I made the cut! YESSSSSS!!! Thank you so much! It's definitely nice being appreciated. Good awards Cher! Congrats everyone! Thanks for your e-mail. Tried e-mailing you back and it didn't go through. Thank you for stopping by my blog and reading about Project: Remembering Noah. You comment means a lot and I appreciate it so much. Cher! You're the best! Thanks for the nomination :) I don't stand a chance with all these fabulous ladies but I sure am honored to be on the list!! How cool is the "Zombie Chicken Award"? So fun & unique! 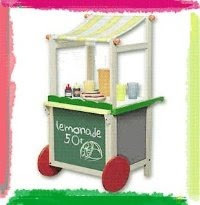 Thanks so much for checking out U create. What a rockin' blog you have! Love the ideas and I'm sure I'll be checking back often. Thanks again. I'm so happy and grateful for the award! Thank you for all of your wonderful posts! You are helping us all so much that are [not so creative] to have stronger marriages! Thank you SOOOO much for the award! I really am SO glad you found my blog so I could find yours! It is so darling! I love it!